Referencing is a huge part of good academic and non-fiction writing, but it is a source of many headaches too (as discussed in my recent blog post). There are many tools out there to help you with referencing, but it is also important to have an understanding of what is required so that you can identify any issues or errors before submission. Today, we are looking at MLA style referencing. MLA (Modern Language Association) style is a common parenthetical author-page (or author-“title”-page) referencing style generally used in the humanities and arts. Today we are going to focus on the most recent eighth edition, released in the summer of 2016. 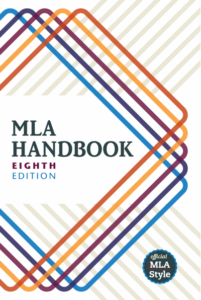 This edition made some very important updates to the MLA system to try to simplify the style with straightforward guidelines that could be applied to any type of source. 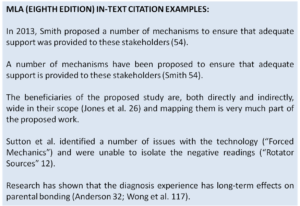 MLA in-text citations are located in the text in parentheses and state the last name(s) of the author(s) and the page number that is appropriate to the information in the sentence. Multiple references within the same parentheses are separated by a semi-colon. If there are three or more authors, then the first author’s last name is listed and then followed by the ‘et al.’ abbreviation. 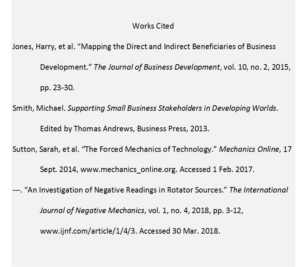 When more than one source by the same author(s) is being cited, then a shortened title should be given for each reference to differentiate them – this title will be in italics for a book and within quote marks for an article. 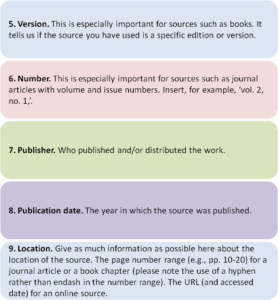 The new changes in the eighth edition of the MLA style guide mean that rather than producing your reference list based on the type of source you want to cite, you use a list of nine core elements. This change aims to simplify the process and help with referencing all of the new types of media that are available. If the source you are using does not have any of these elements, then just leave them out. Some sources will have more than one piece of information for an element – include them all and separate using a comma. 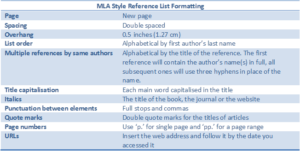 The MLA style reference list will start on a new page and will be double spaced. Each reference will have a first line overhang of 1.27 cm. The list is given in alphabetical order according the the first author’s last name. 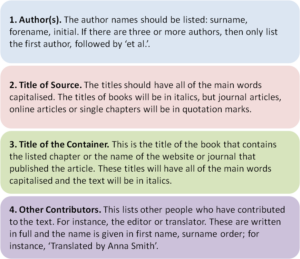 If there is more than one reference by the same authors, then the sources are listed alphabetically by the title of the reference. Rather than listing the authors each time, three hyphens in a row replace the author list after the first reference has been given. 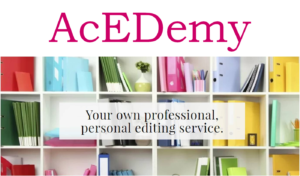 In the next AcEDemy blog, we will be looking at referencing using the APA (American Psychological Association) style. ← Referencing – why is it so important?